Oh wow, I really really love both of these outfits! I love the print on that first dress. It's so pretty! Love that first dress! And the puppy is too adorable! OMG!!!! I love that Miu Miu clutch!! It's beyond gorgeous!!! Beautiful lace skirt. Funny, you're having a heat wave and over the next few days here the wind chill is supposed to be -30 to -40...yuck! You look is very nice! Lucky you that you can still walk around wearing skirts and sandals! Love both outfits! Really cute! Hope everyone is safe from the bushfire! the both outfits are very cute!! that tunic would definitely be great for the heat at the moment! and i love the way you styled it, perfection! i can hardly believe how hot it is - glad you managed to stay indoors :) the second outfit is way cool mica - and those sandals are amazing!! really nice pair! I got back to work today - everyone wanted to know how I survived the heatwave, as they rode it out in the office aircon, haha! Glad you're staying chic in the heat! I love that red bag! Hope you had a good weekend!! i love that dress!!! how cool & fabulous. great pairing of the skirt & tee mica. looks so good. Your puppy is so cute! Loving your blog and so excited to be a new follower! Your printed zara dress is sooo pretty and I love the clutch in your second outfit! Thanks so much Mandi! Hope you had a great Christmas and New Years too. Love your dress and super incredible bags as usual. I've heard how hot it is in Brisbane I can just imagine! I'm dying for that Redlenciaga!! Cute as always Mica!! I especially love your Zara tunic, it looks easy breezy and yet chic. Hahaha I survive the heat in the same way, trying to stay in the AC as much as possible!! Love the 1st dress, so cute!! Another 2 cute looks that work great for summer! 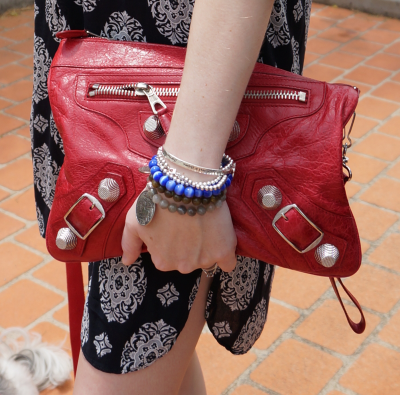 PS: That HOT red Bal Clutch is GOOOOOORGEOUS!!!! You work it well! & that Zara dress looks absolutely amazing on you! totally obsessed with your second outfit! burgundy + lace looks amazing. there isn't too much volume in the skirt, so the relaxed fit shirt works well. love the bag too -- wow! Can I have both these outfits please?! Love the looks! We are very safe, thank you! :) The fireys are doing a great job keeping people safe. Looking good cutie! Adorable dress. Love it!!! I love both of these looks! Your bag is the cutest thing in the 2nd look! I hope you are staying safe from all those flames/smoke! Thank you, we are safe, it is just a little smoky now and then. Ah that Miu Miu clutch is adorbs! Hope QLD weather isn't too crazy like Sydney! You pretty girl! I adore the first look to piece, the printed dress is gorgeous, while the red accents could not be anymore perfect! I really love the tee over your dress! Such a fab combination. And thanks so much for linking up with Mix it Mondays! Both of the those outfits are absolutely gorgeous! They exude such effortless luxury, like you're about to casually hop on a yacht or something of the sort. Lovely! what a pretty printed dress!! i never have much luck at Zara but i gotta keep checking that place out! love the shirt dress - great for the hot weather at the moment! I am so sorry about the bush fires, Mica....I pray that no one is hurt. Stay nice and cool, ok?